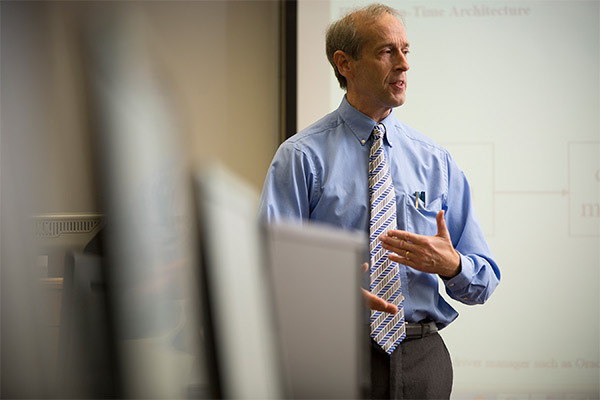 In the IMA program, 100 percent of faculty have earned Ph.D.s, M.B.A.s, or M.F.A.s, and they serve, first and foremost, as professors. 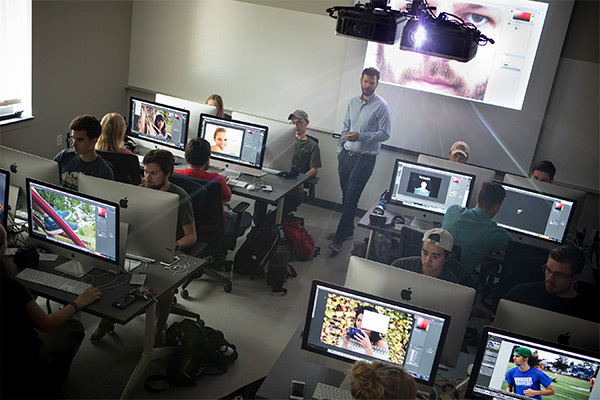 The integrated media arts faculty are an interdisciplinary group, made of professors from the art, accounting, business, economics, information technology, communication, theatre, and English departments. 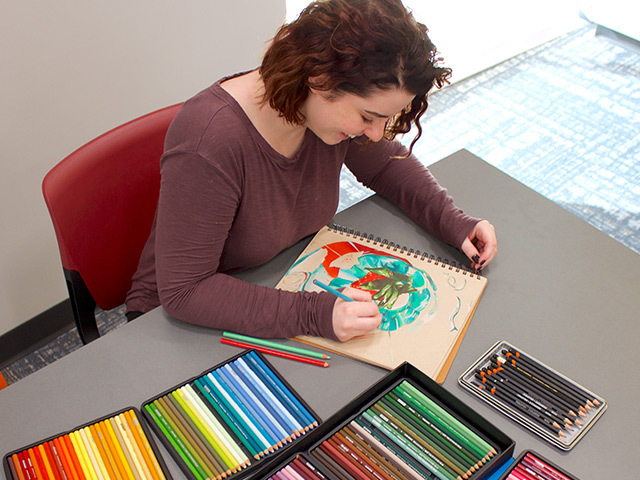 Integrated Media Arts (IMA) is an interdisciplinary program that enables students to graduate as multimedia specialists by effectively tying together multiple departments across campus. 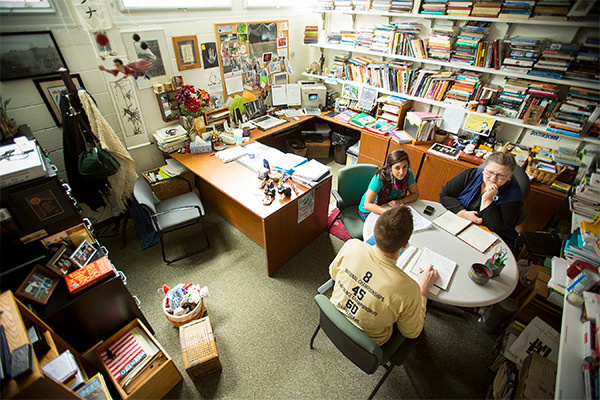 Juniata’s liberal arts environment is ideal for studying across academic disciplines. The IMA program encourages students to think about who they are and find their own digital identity. Students interested in studying Integrated Media Arts take core courses within the designated program of emphasis (POE). This designated POE is most similar to a prescribed major. There is flexibility to choose electives, research, experiential learning, and capstone experiences. If you are seeking more flexibility you may choose to individualize and choose from a pathway or create your own to meet your unique needs. Click on the banners below and learn more about what makes an integrated media arts experience unique at Juniata College. Work with Juniata’s Digital Media Studio or Video Production Team on projects for the Juniata marketing department and in the Technology Solutions Center filming productions for faculty. Or create your own projects. Our students have earned four Telly Awards, one Davey Award, and one Cuppie award in the last five years. Many of our graduates become multimedia specialists for companies, colleges, and non-profit organizations. 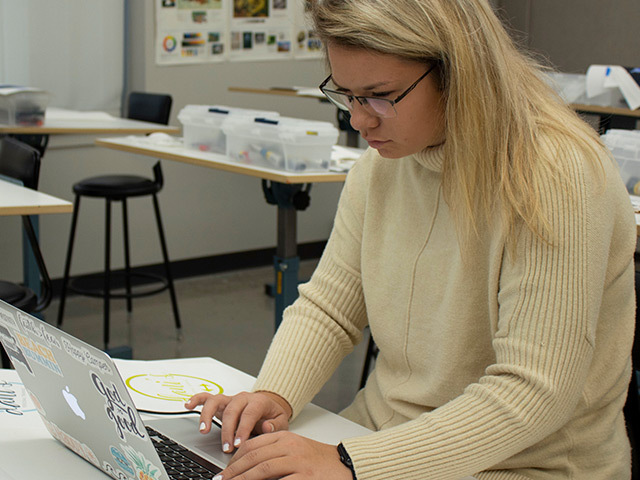 From digital video production to traditional media arts, you can study a variety of fields at Juniata including 3D design, advertising, and marketing. 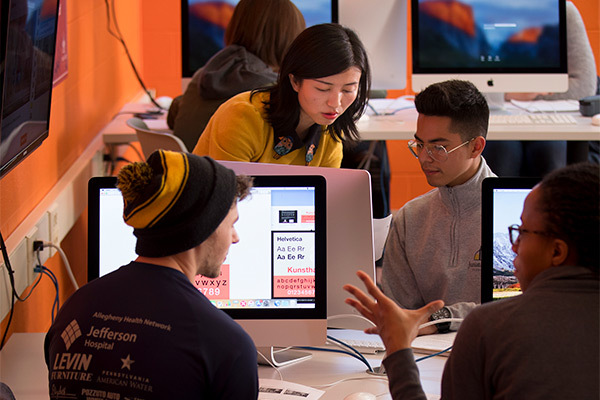 Choose from one of the different integrated media arts pathways or create your unique program of emphasis that highlights other fields of interest. From digital video production to multimedia marketing, you can study a variety of fields at Juniata to support your career goals. Juniata’s Integrated Media Arts (IMA) graduates are employed in industry at places like NYU, Roadrunner Records, AMC, 20th Century Fox, and independent production companies. Some operate their own businesses in fields such as art, photography, and videography. They also attend graduate schools in the digital arts and storytelling. Emmy Award-winning cinematographer Mike Trim '84 and Retired Executive Director of the Academy of Motion Picture Arts & Sciences Bruce Davis '65 visit, lecture, and mentor on campus. They are just a few Juniata alumni from whom our students have received not only advice, but valuable internships. found employment as a video editor at FoxPro, Inc., in Lewistown, Pa. During her undergraduate career, Maddie interned at this same company. found employment as an e-marketer for Active Motif in San Diego, Calif. While an undergraduate, Sonika worked for Juniata’s marketing department and interned for Citizens of the Arts in Harrisburg, Pa.
found employment as a social media and public relations intern at Longwood Gardens, a part of Greater Philadelphia Gardens. Morgan held a position as a video production intern with Upbeat Productions while studying abroad as an undergraduate in London, England. found employment as a post-production assistant at Sneaky Big Studios in Scottsdale, Ariz. 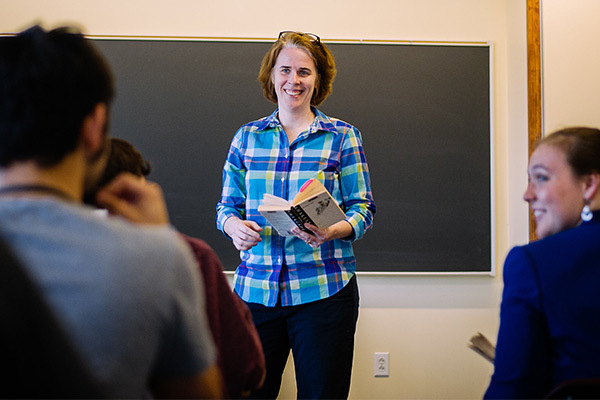 Gaining Experience: Juniata’s IMA program conforms to your interests. Some students have created film projects in the Digital Media Studio, or filmed television commercials for production companies. Others have had internships at EMI Music, The Rachel Ray Show, The Colbert Report with Stephen Colbert, and with Emmy-winning documentary maker Ken Burns. Technology: Gain access to editing facilities, audio equipment, cameras, and a willing crew of your peers. Our students become proficient in Adobe Creative Suite software and social media platforms. 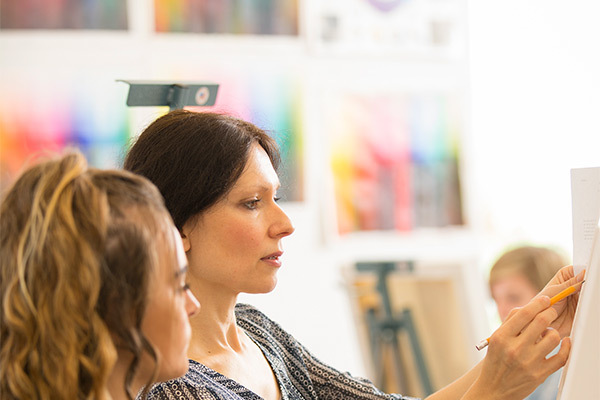 Flexibility: Combine the study of integrated media arts with any POE. Study Abroad: Popular study abroad sites for integrated media arts include York St. John, England; Cork, Ireland; and Newcastle, Australia. Study filmmaking, animation, and other digital media topics. These sites include internship opportunities.